Audi has done it again. Audi collects its 13th 24 Hours Win in 15 years marking 5 wins in a row! Audi has gone 1-2 in the 2014 edition of the 24 Hours of Le Mans! Fassler, Lotterer, and Treluyer earned the honor of winning this great race in the No. 2 Audi. Their sister car, the No. 1, brought home second, while the No. 8 Toyota fought back after an early crash to finish third. 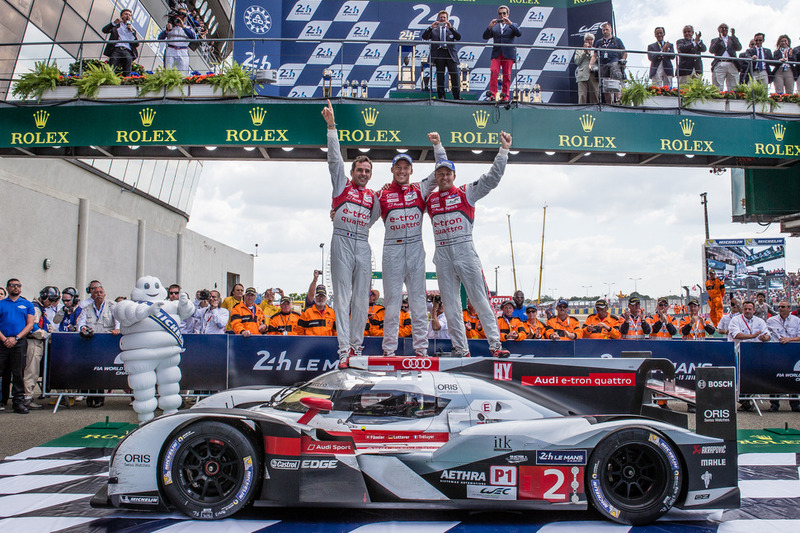 Follow the world’s most famous endurance race hour by hour as Audi take their 13th Le Mans win. The fast, economical and reliable Audis came through for victory yet again as the #2 Audi scored the German manufacturer's 13th overall victory at Circuit de la Sarthe. Toyota worked miracles in the garages to give Anthony Davidson, Nicholas Lapierre and Sébastien Buemi a podium finish after the #8 Toyota crashed early on. Mark Webber in the #20 Porsche was challenging for victory but retired just 90 minutes short of the finish line. The #20 Porsche 919 Hybrid, which will be driven by Mark Webber later on, leads the Le Mans 24 Hours by a slender margin. There was drama after the first hour when a sudden deluge of rain caused carnage. A collision between the #3 Audi, driven by Marco Bonanomi, and the #8 Toyota, driven by Nicolas Lapierre, put the Audi out of the race and cost the Toyota more than half an hour in repairs. The racing has been really close with Alex Wurz leading from pole in the #7 Toyota, before being overtaken in the pits by the #20 Porsche, started by Timo Bernhard. Only 20 seconds separate the top two cars after the first three hours, with the two remaining Audis a little further back in third and fourth. Mark Webber is expected to take the wheel of his Porsche just as night begins to fall. "Driving at night is one of the hardest aspects of Le Mans," he said. "That's not something I've had much experience of before, so we'll just have to get used to it." Meanwhile Sébastien Buemi is 43rd, having taken over the #8 Toyota from Lapierre. On Twitter: @eracingmag Buemi ready to take over from Lapierre. Mark Webber is finally making his Le Mans race debut, having been to the 24 Hours twice before but never getting the chance to drive. The Australian took over the #20 Porsche just after 9pm from Brendon Hartley, with the crew lying fourth. Hartley had a small drama just before he handed over to Webber, overshooting at Arnage and taking a few moments to get going again. It's still a very close fight at the front, with Stephane Sarrazin having just handed over the lead Toyota to Kazuki Nakajima, who set their pole position time in qualifying. "I was just trying to keep it very safe, no risks," said Sarrazin. "But this race will always surprise you, so we kept pushing. It was really tough earlier on in the wet, but in the dry it is OK. We have good pace." Just behind the Toyota, and in front of Webber's Porsche, is the leading Audi of former Le Mans winner Benoit Treluyer. With nine hours gone, Mark Webber handed over the #20 Porsche to Timo Bernhard in a solid fourth place after a lengthy quadruple stint with no major incidents. It’s been tough but I still feel good. The #7 Toyota is still leading by one lap, now with Alex Wurz back at the wheel. Behind Wurz is the second Audi, driven by Andre Lotterer, which has been pushing him hard to try and make up the gap. One of the big surprises is the #1 Audi, which was destroyed in testing, necessitating a last-minute change in the driver line-up. Former F1 driver Marc Gene, who was slotted into the team with two days to go, has risen to the occasion brilliantly, holding third. Tom Kristensen, the most successful driver at Le Mans with nine victories, has just taken over. At the halfway point of the 2014 Le Mans 24 Hours, the fight for supremacy is turning into an intense tactical battle that centres around tyre strategy. The #7 Toyota, now driven by Stephane Sarrazin, leads ahead of two Audis: driven by Andre Lotterer (#2) and Tom Kristensen (#1) respectively. However, the Audis are running quadruple stints on each set of tyres whereas the Toyota can only do a triple stint. As a result, Toyota driver Alex Wurz – who handed over to Sarrazin – was able to hold off the Audis behind, but not extend the lead. "The car is OK but it doesn't grip so much during the night," said a visibly exhausted Wurz. "We can do the triple stints, but it isn't easy." The #1 Audi seems to have developed a technical problem that has slowed it considerably, which means that it is now receiving attention in the garage. This hands a chance to the two LMP1 Porsches, which have been running consistently in fourth and fifth on their Le Mans debut. Mark Webber enjoyed a good quadruple stint and will be back in the #20 Porsche shortly after dawn. Sébastien Buemi is sixth in the #8 Toyota. Nicolas Lapierre crashed the car in the early stages of the race. Although it was repaired after 30 minutes in the garage, the handling has never quite been the same. It's been all change at the front of the field, with the leading Toyota having retired with an electrical problem, handing the lead to the #2 Audi of Marcel Fassler, Andre Lotterer and Benoit Treluyer. However, they developed turbo problems, and after a quick fix in the pitlane failed, it was pushed into the garage for a 20-minute turbo replacement. The net result was that the #1 Audi, currently driven by stand-in Marc Gene, has the lead and is pulling away – incredible, given that the car was totally destroyed little more than 72 hours ago. Mark Webber is now second in the #20 Porsche, a lap behind. This car has only been doing 13-lap stints, while the Audi has been able to do 14 laps on each full tank. It's also fractionally faster during each pit stop. Webber is the meat in an Audi sandwich, with Fassler now third, albeit a lap down. I always said that if we could see Sunday morning, we'd be doing well and I'm delighted that we've achieved that. Some way back is the last remaining Toyota, driven by Nicolas Lapierre. "For the first event, it's pretty good," concluded Webber. "I always said that if we could see Sunday morning, we'd be doing well and I'm delighted that we've achieved that." On Twitter: @Audi__Sport Don't sleep at Le Mans! Just three hours to go and it's going to be another nail-biting finale. The leading Audi, driven by nine-times Le Mans winner Tom Kristensen, suddenly stopped on the Mulsanne Straight – and then seemed to get going again. But moments the team decided to change the turbo: a 17 minute job. This meant that Timo Bernhard swept into the lead once more with the #20 Porsche while the Audi was being fixed. It rejoins in third place, with Lucas di Grassi driving. So the battle for the win will come down to the #20 Porsche and the #2 Audi, driven by Andre Lotterer. The Audi is slightly quicker than the Porsche, but Bernhard is reacting. He will then hand over either to Mark Webber or Brendon Hartley to finish the race – but it’s going to be a close one. We're disappointed but we're not giving up. Anything can happen at Le Mans. The #8 Toyota, driven by Sébastien Buemi, Anthony Davidson and Nicolas Lapierre is closing in on a podium after the accident that slowed them at the beginning of the race. "We're disappointed but we're not giving up," said Buemi. "Ever since we had to fix the car after the accident it's not been right, but anything can happen at Le Mans." Mark Webber's hopes of victory at Le Mans were dashed with just 1.5hrs to go, after his Porsche 919 lost drive shortly after he had taken it over, in an attempt to hunt down the winning Audi. With its principal challenger out of the picture, victory went to the #2 Audi driven to the flag by Benoit Treluyer, which he shared with Marcel Fassler and Andre Lotterer. This was the same crew that was victorious in 2011 and 2012. Another Audi, the #1 car, finished second – a miracle as this was the same car that was destroyed by last year's winner Loic Duval in practice on Wednesday. "It's been such a tough win and especially pleasing because our guys worked so hard to achieve it," commented Audi team boss Dr Wolfgang Ullrich. "This victory really means a lot." Third was the #8 Toyota driven by Sébastien Buemi, Anthony Davidson and Nicolas Lapierre, which fought back from an accident in the early stages of the race that cost them more than half an hour. The other Porsche 919, #14, retired shortly after Webber with gearbox problems but came back to cross the finish line after an incredibly intense race, which Porsche, Audi and Toyota all led at some point. In total, the winners completed 379 laps and 5165.39 kilometres. Not a bad day's work!